George Orwell would probably say that Mayor Kip Holden’s media spinners successfully used the Baton Rouge Business Report to be their mouthpiece for the fall EBR Parish mayoral race. 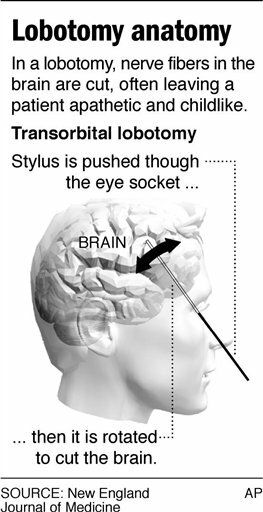 It seems as if political consultants intend to give the voters a frontal lobotomy. Voters should not be summarily dismissed. This seems to be the essence of yesterday’s presentation to voters of the parish informing all of us – that we should just calmly line up at the voting booth and mindlessly pull the lever for Mayor Kip Holden this fall. The polls are in and it’s over. An extremely skewed look at the opposition indicates so much conspiracy that JFK theorists are left in the dirt. So much for unbiased media. How many ways did the media spinners tell us to accept the predestined choice of Holden as our next Mayor? These excerpts pretty much wrap up the election explaining that Holden is: “immovable”, a shoe-in”. “a foregone conclusion”, “in good shape”, “can only be derailed if the world comes to an end“,“a virtual certainty”. Well now, why do we even need an election? What were Holden’s opponents thinking? I realize I will make no friends with this blog, but then I’m not here to make friends. How dare that Red Stick Republican opine. So folks, let’s just stop thinking, talking or listening to anyone who might remotely suggest that someone else is running for Mayor and might have what it takes to make changes in our traffic, crime or quality of life. We are stuck with the current Mayor, Kip Holden, and there is absolutely nothing you can do about it. In the words of Stevie Wonder: Signed, sealed, delivered, he’s yours. The article even goes to such lengths to state that Red Stick voters are so deliriously happy with where we are and that we credit the Mayor for our manic feeling about EBR Parish. Wow. Repeat after ‘them’: “We love Baton Rouge. The parish we live is has no traffic problems. We have all crime under control. We are happy with our taxes and can’t wait to pay more taxes. We believe all spending by city-parish is needed and there is no need to cut wasteful spending. We want to pour a ton more money into downtown. We believe our education system is top notch. Our sewer system is not overflowing. We want to build a new prison to make it more comfortable for offenders. We know our neighborhoods are safe, our children can roam the streets with no worry about their safety, and we should probably not lock our doors at night. We do not have a drug trafficking problem. Food prices and gas prices do not worry us in the least. Life in the Red Stick is the best in the nation and we are #1 in quality of life. Pretty soon we will be a top tier city and businesses will be flocking here to pay our tax increases. Right now all routes into the parish are jammed with new residents moving here to enjoy the good life in Baton Rouge. All we have to do is keep chanting this mantra and remember that where we are today is all because of Mayor Kip Holden who has been scandal free in his first term. We trust him with our lives, our daughters and first born sons.” After all, he has 24/7 security guards! In fact, why not call your physician and set up an appointment for a frontal lobotomy. Rent the movie “One Flew Over the Cuckoo’s Nest“, pop some popcorn, grab a cold beer and sit back and just let things take the course that is already set in stone. Your vote doesn’t matter. Neither does your opinion. The tax will pass, and the Mayor is in for the long haul. Open your mouth and take your medicine like a good little boy or girl and go to your room and enjoy your time out. The decision is made for you today! You are free from any decision to choose someone other than Kip Holden as your Mayor. P.S. For those who have a mind of their own, stay tuned!